The so-called two-step QCA approach as formulated by Schneider and Wagemann (Eur J Polit Res 45(5):751–786, 2006) proposes a separation of conditions into two distinct groups—remote and proximate—and to analyze the impact of these conditions on the outcome in a stepwise manner. While the general logic of the two-step protocol seems to resonate with a broad range of scholars, it, so far, has been only rarely (successfully) applied. This paper argues that this discrepancy between theory and practice is due to the ill-defined nature of the first step. Schneider and Wagemann propose step 1 to be an analysis of inconsistent sufficiency. This has always stood on shaky set-relational grounds. I therefore argue that the first of the two steps in the protocol should be redefined as an analysis of necessity and only step 2 understood as an analysis of sufficiency. While already implicit in its original formulation, this crucial feature of the two-step QCA approach has largely been overlooked. 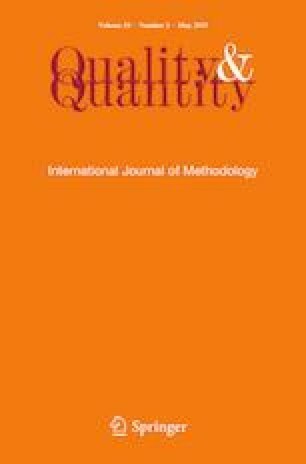 This paper proposes an updated two-step QCA approach that rests on recent innovations in set methods and spells out the advantages of this new protocol.